From Mary Shelley to George Orwell to H.G. Wells to William Gibson, science fiction has been the most enduring, most convincing way for artists to engage in tech policy issues. 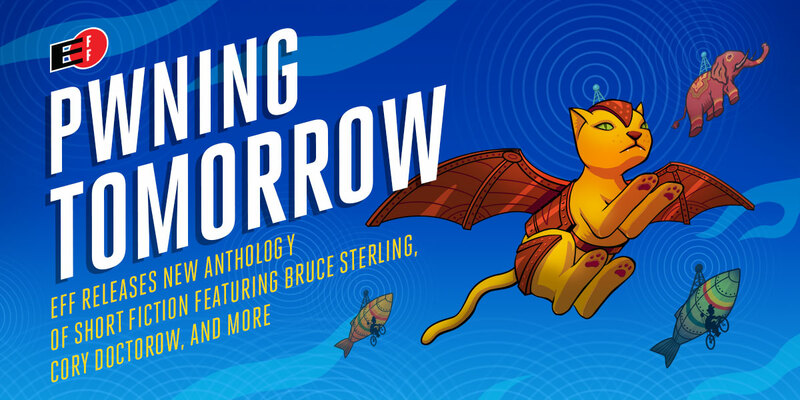 As part of EFF’s 25th Anniversary celebrations, we are releasing “Pwning Tomorrow: Stories from the Electronic Frontier,” an anthology of speculative fiction from more than 20 authors, including Bruce Sterling, Lauren Beukes, Cory Doctorow, and Charlie Jane Anders. To get the ebook, you can make an optional contribution to support EFF’s work, or you can download it at no cost. We're releasing the ebook under a Creative Commons Attribution-NonCommercial-No Derivatives 4.0 International license, which permits sharing among users. It's also important to know that writers have long been at the forefront of the fight against mass surveillance in the real world. Paranormal romance author Carolyn Jewel is the lead plaintiff in Jewel v. NSA, EFF’s long-running lawsuit against warrantless collection of electronic communications. Her novella, "Free Fall," rounds out the collection. We’re very grateful to the authors for contributing stories to this collection, Tessellate Media for tireless formatting and device testing, O’Reilly Media and Troy Mott of Backstop Media for epublishing assistance, and the many others who helped bring this project to fruition. The collection is available in ePub, and MOBI formats, which can be downloaded at https://supporters.eff.org/donate/pwning-tomorrow.